Build remote-control lego robots. Experiment with different gear ratios, wheel sizes, and number or motors. Compete in teams and individually in obstacle courses, relay races, and robot sumo-wrestling. Robotics is a great way to experiment with mechanical and electrical engineering, while simultaneously competing in robotics camp games. 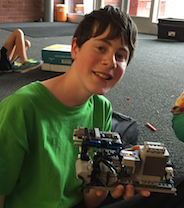 Robotics courses can have jumps, sand pits, and other hazards all combining to encourage campers to make tradeoffs between speed, maneuverability, and strength when constructing their robotic masterpieces.